Ian Fleming wrote 14 books about his creation, secret agent James Bond, 007. "Bond's car was his only personal hobby. 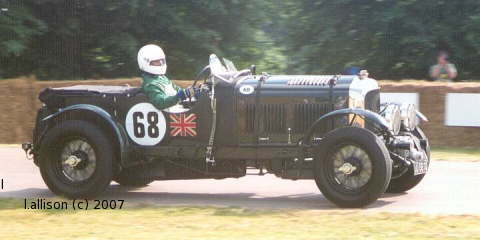 One of the last of the 41/2-litre Bentleys with the supercharger by Amherst Villiers, he had bought it almost new in 1933 and had kept it in careful storage through the war. ... It was a battleship-grey convertible coupe, which really did convert, and it was capable of touring at ninety with thirty miles an hour in reserve." The old Bentley gets a brief mention but Live and Let Die is set largely in the USA and Jamaica. Bond pondered buying a newer Bentley to replace his 1930 41/2-litre supercharged one (bought in 1933 -- CR) and when the old one had a bad smash during a chase he bought a "1953 Mark VI" with an "open touring body," in battleship grey, of course. The Mark VI Bentley was built from 1946. "The twin exhausts of the Bentley woke to their fluttering growl" as Bond set out to drive from his flat off the King's Road to the office, but the action took place in Istanbul, where the local agent used "an old black basket-work Rolls Royce coupe-de-ville", and on the Orient Express to Paris. Strangeways, the short-lived agent in Jamaica, drove a Sunbeam Alpine, one of the first models. It cannot have been one of the later, rather attractive, "series" Alpines due to dates. Bond also drove the car but switched to a less conspicuous Austin A30 hire-car and, at the end of the novel, also drove a Hillman Minx. We also learn that M was driven to work in an old Rolls Royce Silver Wraith. Bond drove a battleship-grey Aston Martin DB III from the car pool. Tilly Masterton drove a Triumph TR3. In the movie (1964), the Aston Martin became a DB5 and the TR3 was replaced by a Ford Mustang. Early in the book, Bond got up close to Shrublands osteopath, Patricia Fearing, in her bubble car. But Bond owned a "Mark II Continental Bentley that some rich idiot had married to a telegraph pole", that he had bought for £1,500, and had straightened and fitted with "the Mark IV engine with 9.5 compression" and a "trim, rather square convertible two-seater affair, power operated, with only two large armed bucket seats in black leather", by Mulliners for £3,000, in "battleship grey", of course -- an expensive car for ~1961. He called it "The Locomotive". The main action took place in the Bahamas. Bond drove a government Land Rover to his tryst with the girl, Domino Vitali (Dominetta Petacchi), who drove an unspecified MG.
"Almost exactly twenty-four hours before, James Bond had been nursing his car, the old Continental Bentley - the ‘R’ type chassis with the big 6 engine and a 13:40 back-axle ratio - that he had been driving for three years, ... Against the solemn warnings of Rolls Royce, he had had fitted, by his pet expert at Headquarters' motor pool, an Arnott supercharger controlled by a magnetic clutch." The R Type Continental Bentley was launched in 1952. The girl, Tracy (Teresa di Vicenzo), drove a Lancia Flamina Zagato Spyder. Set in Japan, Bond was picked up at the airport by Henderson in a "smart Toyopet saloon" (a Toyota). From a collector's point of view, Bond really should have restored the 1930 41/2-litre supercharged Bentley that was written off in Moonraker.